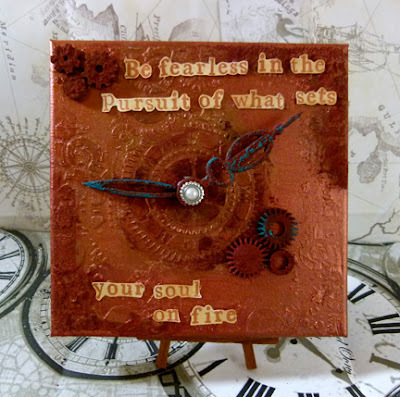 Hi all, I am guest designer over on the Rebecca Baer blog today and I am sharing a canvas I made using the Steampunk Clockface Stencil (ST-613). I love these because there are so many parts of the stencil that can be used to create unique backgrounds. I took a 7x7 inch blank canvas and using thick texture paste I created a textured boarder using the flourish along the side of the stencil. I dried it with a heat tool to prevent smudging. Next I took the clock in the center of the stencil and applied it to the center of the canvas. I dried it off and then applied another layer of texture paste to make it stand out. I then painted the whole thing in bronze and copper paint and then did an undercoat of red shimmer paint over the clock before painting it copper. 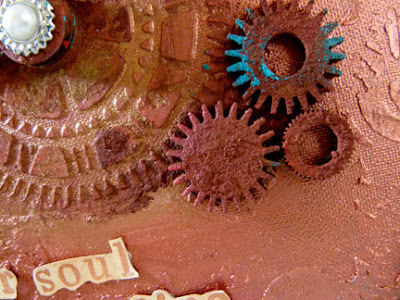 I then mixed brown and orange acrylic paint together to create a rust color, which i added cinnamon powder over while it was wet to create texture. I then dabbed over the top with more paint to seal it and left to dry. I used some of the paint mixture on the clock face which I dabbed on with my finger to give the fine details an even covering of rust. 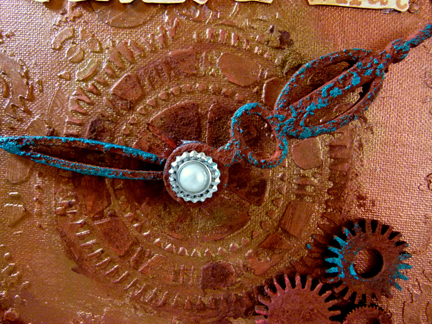 I used blue shimmer paint on the clock hands to create a peeled paint look and adhered them to the clock with a glue gun, adding an ornate brad to the center to finish it off. The quote was made using an alphabet stamp set and smooth card. I cut out the words and spritzed them with Sepia Ink before adhering to the canvas.